Cutting sliding screen doors is sometimes necessary when your house settles or shifts. If you are constantly replacing rollers and you can see evidence of the screen door scratching the patio door frame both above and below, you probably need to cut the frame to get it sliding properly again. There are situations such as when you need to shorten a frame. When patio frames sag or get distorted because of settling over time, trimming the screen door a little shorter is sometimes the quickest way to get it sliding again. Or, you might find a used screen that is taller than what you need and have to cut it down so fits your door. A repair task like cutting a door to height is not usually a big deal with the majority of screens that have mitered frames that fit together at 45 degrees. Once the miter cut is done you will probably have to re-drill the roller adjustment hole as well. Because now that the frame is shorter the old hole may be too low or completely cut off. A sliding screen door repair like cutting a frame to a new width is a bit more difficult because you not only have to miter cut but also make a new rectangular mortise for the roller. As well, if you shorten the old rails the old mortise may interfere with the new miter cut and make the frame unusable when you try to reassemble the corners back in. If you are just cutting no more than 1/4” off the width, you can get away with widening out the existing mortise by levering out new material with pliers. That will insure the roller assembly will fit after. Any more than 1/4” will move the old mortise closer and closer to the end making the frame weaker after reassembly. The width dimension is less critical anyway. So long as your door is more or less the same width as the glass door that slides in your patio door, your sliding screen door repair will work fine. Avoid trying to make a 48” wide door into a 36” door wide ! To cut a new mortise properly, you are going to need a router with an aluminum cutting blade, a router table and a jig to hold the rail steady so you get an accurate cut. Once you get those things you might as well make screen doors for a living. Cutting a screen door frame to length does not require complicated tools. Frames can be cut using just a hacksaw with a metal cutting blade. What is important is that the frame has be clamped down and you use a miter box so that you get a really nice accurate miter cut. Most frames are mitered together and held together by a friction fit corner. Any small defect in cutting the miter will stand out like a sore thumb when you put the frame back together. Clamping the rail down is important because if you dont the saw will move the rail around while cutting. No matter how much you try, you wont be able to hold it steady enough. Clamp the rail down first so that all you have to concentrate on is the cutting. A cheap wooden or plastic miter box is good enough to guide the hacksaw to cut a nice miter once everything is clamped down. If you want to use your power miter box you will need a “non ferrous metal” cutting blade. If you try to use your standard cross cut blade on aluminum the material is so soft it will jam the blade and wreck the part you are working on. Even non ferrous cutting blades need frequent sharpening and the use of hard wax cutting lubricant to produce consistent quality cuts. Non ferrous cutting blades generally have more teeth than a regular cross cut blade. The teeth are also cut at a “negative rake” angle to clear the chips or aluminum cuttings. Safety glasses and eye protection are absolutely essential when cutting aluminum with a power miter box. I have had aluminum shards fired into my face more times than I can count. Dont take any chances. Cutting metal of any kind is much more hazardous using power tools. How is a screen door held together ? I can't seem to find a screen door to fit my patio door frame...best I can tell is that I need to cut the aluminum frame down to 69 1/4" LG. my question is once I cut the frame length shorter ....what refastens the miters back together ? 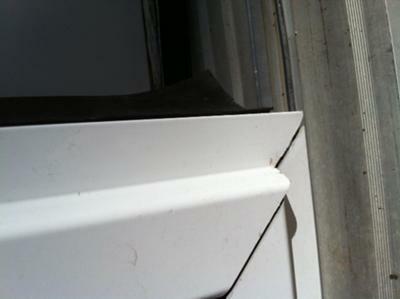 The mitered screen door frames are just held together by 4 friction fit corners and the tension in the screen material. First pull out the screen cloth. Next make sure the roller adjusting screws are not sticking out preventing the frame from coming apart. Last just use a rubber mallet to knock the bottom of the screen door off. Once you cut the door shorter you will need to re-drill the holes for the roller adjusting screws. I'm moving into a new house that recently replace with new sliding glass doors. However the accompanying sliding screen doors are too long and don't fit onto the tracks. Can you cut/saw the frame? If so, what is the best way to do so? Any tips/tricks would be very helpful. Depending on the type of screen door, they can be hard or easy to shorten. Doors that are mitered together are easy. Remove the screen material, disassemble the frame with a rubber mallet and shorten the vertical rails by the same amount on both sides. You can do the job with a miter box and a hacksaw but the best tool to use is a power miter box with an aluminum cutting blade. Doors that are notched together are more difficult because they were cut in the factory using special punching machinery. Easier in those cases to replace the screen door with a new miter cut one. We bought a screen door and just barely got the rollers to fit onto the tracks. Now it doesn't slide real well. Any suggestions besides starting all over again and replacing it? If a slider is too tall its not impossible to shorten it. If the the door has 45 degree miter cuts at each corner, all you need to do is pull out the screen material and gently knock off the door bottom rail with a rubber mallet. Using a hacksaw and a miter box, shorten both the tall rails. Reinstall the bottom rail and test the door. If the height is correct it should be easy to reinstall and take out. Repeat this procedure taking 1/8" off the height at a time until it fits perfectly. I custom ordered a slider for my oversized sliding glass door, and the problem is simple . . . i ordered it 1/2 inch too tall. is there a way to cut the door down (from the top or bottom) by this small amount? Just FYI, we already tried jamming it in the track b/c it's slightly flexible - but it's still slightly to tall. Changing the height on a mitered aluminum slider requires removing the spline, pulling out the cloth and then taking the frame apart. The frame is held to together with "L" shaped corners. Make sure the roller adjustment screws are not in the way when you knock apart the frame with a rubber mallet. You can shorten the both the long bars using a miter box and a metal cutting hacksaw. Its best to clamp the long bar and the miter box to the work table to get a nice clean 45 degree cut. If you are not sure, cut off 1/4", then assemble the frame and test. Repeat until the door fits. A few years back we had our screen doors replaced. We called a couple of places and found that they were all within a few dollars of each other. We decided on one that had been open for quite a while and they came out. It was an older gentleman and two of his kids or grandkids. He told us he was training them to take over but that he would supervise. After over 8 hours and multiple cuts they could not get the doors on correctly and told us it was because our tracks were not strait and could not be straitened. We said oh well and went on with our lives. Very quickly the problems started. I was not much of a handyman at the time so I just kept getting frustrated but dealing with it. Now I like to fix things, or try to, so I've fixed most of the problems but on one of the doors they put it together crooked. I don't know how they are put together and don't want to hut it by trying to take it apart and fix it. So, I guess my question is, how is an aluminum slider put together? An aluminum slider usually has 4 aluminum die cast corners that hold the frame together. To assemble the frame, the corners are just hammered into the ends of the rails using a friction fit. To dissasemble the frame like yours, first make sure any adjustment screws are not poking out of the frame. Then you remove the screen cloth and use a rubber mallet to gently tap the rails apart at the corners. The most important step in installation is getting the door size right. Most screen doors need 1/4" of play to allow you to push the bottom in on installation. If your door rides in a channel at the top, measure from the top of the channel to the top of the bottom track and subtract 1/4" to get the proper height. If your door rides on a rail or track at the top, you will have to measure from the bottom of the top track to the top of the bottom track then ADD 1/4" to get the door height. You add because in this style the slider has to overlap the tracks by 1/8" on the top and the bottom. One other very important thing to check is the condition of the patio door. Measure the height in three places. On the left, the right and in the middle. If the heights are more than 1/8" different from each other, you will have to fix that before attempting to install a new slider. Hi, I am looking for a kit that I can install as a swing out style screen door. I currently use one that I made myself out of thin, rolled aluminum window frame (I used oversized pieces) but it's to flimsy and flexible. I love your style of frame but don't need the sliding hardware. Here's my million dollar question, do you think I can just use your frame, hang it on hinges and replace the handle with something that can latch in my setting? I suppose there will be a lot of waste since I won't need tracks and rollers. What do you think? Yes my kits can be used with hinges. There is no reason you cannot put hinges on one of the vertical rails and hang it like a regular door. You would need to remove the 4 rollers on the top and bottom. The latch is built in but would not work in a hinged application. I am sure you could find simple handles that would be more appropriate for a hinged door in a local hardware store. A lock would be a bit more tricky because you would need something small enough to fit within the width of the vertical rail. I'm thinking magnetic latches would work. I'm looking to get 2 sliding screen doors made for my place. Are you able to ship to Sydney Australia and how much extra is the cost of the shipping? Also, as we use meteric system here is it ok to send you the measurements in millimeters? I have checked with both US Post and Canada Post and neither allow surface shipments longer than 40 inches. So that cuts me out of the the least expensive method of shipping. That only leaves the courier companies such as UPS and DHL who would charge more for shipping than the slider kit costs. In the past, the only way I have been able to make this economical is when I am shipping 10 or more screen doors internationally. There are shipping lines where the shipping cost gets more reasonable for these kind of quantities. If you know of a shipping line (I'm talking about real boats here, not courier companies) that services Australia, I would be glad to check into their rates. When I order a slider kit do you need to know whether the door has to be a right or left hand door? Normally the latch is installed exactly in the middle of the height bars so it wont matter if your patio slider is right or left handed. If your patio slider is extra tall, say 90 inches or more the latch may need to be located lower than the middle of the bar. Even then, since you assemble the door yourself, you can still install the bar on whichever side suits you best. My house is missing the sliding screens. i want to replace it with a new one how do i figure out the size since i dont have the old one to measure? Most patio doors have a slider channel at the top and a track at the bottom. Some types have both a track at the top and at the bottom. For the first kind measure from the top of the channel, to the top of the bottom track. Subtract a 1/4". Thats the height of the new slider. For the second type measure from the bottom of the top track to top of the bottom track. Add 1/4". Thats the height of the slider. The width of the slider is usually the same as one of the sliding glass panels. How do I measure for the correct patio slider width so that the bug flap operates properly? I'm guessing that the slider width should reach to about half the width of the stile of the fixed panel. I just want to make sure so that I dont order the wrong size. The width of the slider is usually identical to the width of the sliding patio door panel.